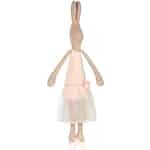 A pink dream is the Maileg Mega Maxi Rabbit Ballerina Rose girl, from her stylish dance suit, to the tutu skirt, down to the ballet shoes. With her 1 m height, she is also a beautiful and a can’t be missed decoration for the nursery. She loves tea parties together with her other Maileg friends and especially with her little human friend. But for that, she will change into something else from the Maileg Mega Maxi collection, so she is dressed appropriately for tea time.